When people think about all the things that can break on a vehicle, a muffler is definitely not on the top of the list. Do Mufflers Go Bad? In short, Yes Mufflers Go Bad. The lifespan of a muffler is typically between 5 and 7 years. Mufflers mainly serve two functions: Reduce exhaust system noise and direct exhaust gasses out of the engine. A muffler can become worn out prematurely due to being exposed to salt and being hit due to pot holes. There are a handful of typical common symptoms that should alert the vehicle owner that their could be a problem with the muffler. Below are three of the most common warning signs that a muffler may be broken, bad, or failing. Engines today are efficient and all of the components parts work together. The vehicle exhaust begins at the exhaust valve chamber inside the cylinder head, flows to the exhaust headers, into the exhaust pipes, then to the catalytic converter, to the muffler, and out the exhaust pipe. When any of these components are damaged, it can impact vehicle performance, including which can result in the engine misfiring. If the muffler has a hole inside the unit and loses its efficiency, it can cause misfiring in the engine, particularly when under deceleration. 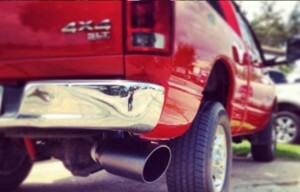 Your muffler should make a nice sound. If it suddenly becomes really loud, this could be the result of an exhaust leak. As engine exhaust flows through the exhaust system, it is contained and eventually flows through the muffler. Inside the muffler is a series of chambers that helps to reduce the vibrations coming through the exhaust which is commonly associated with sound. When the muffler is damaged or has a hole in it, this causes the pre-muffled exhaust to leak, which increases the sound that comes out of the exhaust system. When the exhaust system which includes muffler, cools down after the engine ran, moisture in the air condenses can pool inside the exhaust pipe and the muffler. This moisture sits there and will eat away at the exhaust pipe and the shell of the muffler. Over time, the exhaust pipe and the seams of your muffler rust out and start to leak exhaust gases and noise. If you notice a lot of dripping from you exhaust pipe, this could mean that you need a new muffler. At Supreme Muffler, we can solve your muffler problems. We have been in business since 1971 and believe in provided quality service. Stop by our shop at 4616 Quincy Street Metairie, Louisiana 70006 or give us a call at 504-885-5950. We are open Monday through Friday from 9-5pm.